Valentine is right around the corner. A time when love continues to flow from person to person. Husband/wife, girlfriend/boyfriend are passing out cards, jewelry, gifts, and winks. Children are passing out cards in the classroom. The restaurants are filled to capacity with hour long wait times. Yes, it's that season. Well don't just get sweets for Valentine, look sweet as candy and be spicy. Spice up your outfit and don't just look like a plane Jane. No offense to the beautiful Name, but that's just a familiar saying. Anyway, have your wardrobe together. No matter what style of clothes you like, there is always another way to dress it up a little bit. Take the time to look in your closet and see how you can change something up, without going out and having to spend a fortune. Try these 4 Fashion tips for women. Stay on top of your game and be the best you can be. Don't forget to Accessories your outfit. You want to wake up looking sweet for yourself and for your sweet honey love. Its time to spread the Valentine love. Protecting your hair from damage, helps you keep an alluring look. After all you want to look sophisticated and classy for your romantic night out. Really you want to keep your hair on point for any occasion. Try these 5 ways to protect your hair while sleeping. Lets not wait until you have a special occasion to attend, before you start a healthy hair routine. Incorporate some healthy hair care tips into your every day life. Be sweet for your sweetheart every day of the year. Look like a sweet, delicious piece of candy that is so tempting and ravishing. Have a whole head to toe allusion of elegance. Avoid making theses 10 mistakes in caring for your hair. 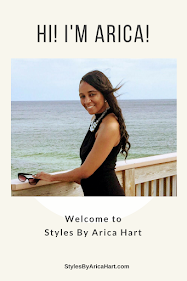 If you would like to check out some creative hair styles by Arica Hart, there are a few links below. Remember, keep your fashion and hair style on point for yourself, your sweetie, or future sweetie. It seems as if you look your best, you tend to feel better about yourself. Have a blessed and lovable day.